WEEKL UPDATES: Are you getting our weekly updates? If you want the latest videos, photos and blog postings - sign-up to get our weekly updates sent right to your email address. PHOTOS AND VIDEOS: Check out recent "weekly news updates." I am thrilled to be disciplining two women in Ocean View! 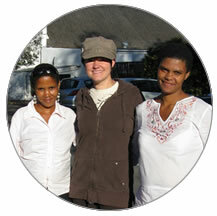 Colleen and Claudine are both high school drop-outs, single moms with several children and few job skills. I am passionate about using micro-loans to help women! The World Cup excitement is definitely here in South Africa! 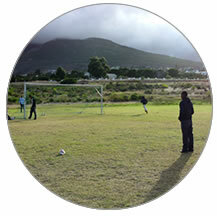 Building on that, I am able to use soccer as a means to reach the youth of Ocean View in relevant ways. 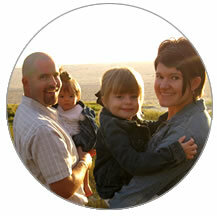 I am passionate about being part of a launch team for building a Community Center in Ocean View. My dream is that the community center would be a safe place for kids - providing a beautiful field on which to play soccer (instead of the street or bare dirt fields they are used to). We have decided to make a 3 year commitment to All Nations for full-time work here in South Africa. We will be in the US mid-July and will return to Cape Town at the end of September. Place to Live - We will be looking for a home to rent here in Cape Town when we return to Africa at the end of September. Buying a Car - We need to purchase a vehicle (vehicles here are 2-3 times more expensive than in the States). God's continued direction - With many needs crying out in Africa, we are relying on Him to show us where to pour our time, energy and resources. We are looking for partners! Please consider joining our financial support team.